Commissioner Borner opened meeting at 8:30 a.m. Commissioner Berry is in Mesa Arizona and was not present for today’s meeting. Secretary Hagstrom was not present. The minutes were taken by Clerk & Recorder Tomassi. Approval of Agenda-Commissioner Carlson made motion to approve agenda as is. Commissioner Borner seconded the motion. Motion carried. 8:40 a.m. Carl Cedar stopped in to request that the Commissioners mention to the road department that his bus route on Snowy Mountain Road needs bladed. Commissioner Borner told Mr. Cedar that his concerns have been noted and that he is more than welcome to come back at 9:30 a.m. and discuss his concerns with the road department supervisor. Mr. Cedar said he will be back at 9:30 and then he left the meeting. Approval of Minutes-Commissioner Carlson made a motion to approve the January 7, 2019 minutes as amended. Commissioner Borner seconded the motion. Motion carried. Commissioner Board information-Commissioner Carlson attended the LEPC meeting in which they discussed the possibility of putting up more signage and sending out letters so that they can inform the public that there could be a chance that #4 Road washes out again this spring. Commissioner Carlson discussed that the City of Roundup is fine with #4 Road being moved, just as long as the city can get back and forth to the lagoons. Commissioner Borner attended the Roundup Reach meeting and she mentioned the need for support letters for the Fish & Wildlife Community Pond. Commissioner Borner discussed the possibility of going after an engineering grant in order to redirect the water flood flow. 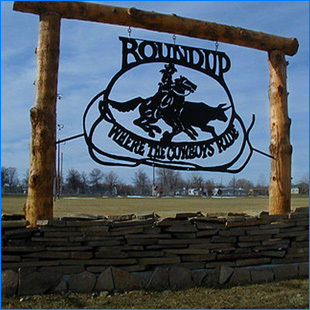 The Roundup Reach will meet again in April. Commissioner Borner also mentioned that she attended the Bear Collins presentation. Commissioner Borner discussed the notice of withdrawal that County Attorney Peterson filed in District Court regarding the Burns vs. Election Administrator Tomassi/Musselshell County case. Commissioner Borner called MACo and they gave her names of three attorneys’ that may be interested in taking over the case since the county fired Mr. Congdon. One attorney was not interested because he is retiring soon. Commissioner Borner reached out to the other Attorneys which are Mike Meloy and Steve Melch. Attorney Melch has not returned Commissioner Borners calls today, but Attorney Meloy has and would be interested in taking over the case. Commissioner Carlson suggested calling both attorneys this afternoon and talking to them so that the county can make a decision today. County owned property not in the FEMA mitigation- Commissioner Borner mentioned that the county currently still owns the 80 acres east of town, the lot across from the ambulance barn and the house next to the Blue Star coffee shop. Commissioner Borner suggested tearing the house next to the Blue Star down and then giving the lot away so that the lot goes back onto the tax roll. Clerk & Recorder Tomassi also reminded the Commissioners that the county owns a couple of lots in Melstone that they took on a tax deed. There is also a small strip of land off of Mosby Road that the county is currently in the process of obtaining from a tax deed. Central Commons maintenance issues-Commissioner Borner reported that Brian Johnson was concerned that the county didn’t believe the engineers report. WWC had some questions prior to turning in their engineers report. Wells Fargo- Commissioner Berry is not in to give an update on the Wells Fargo building. Lori Jett entered the meeting. Bids for Extension Office-Commissioner Carlson reported that he has been working on putting together a bid package with Extension Agent Mat Walter. The bid package should be complete in about a week. Storage in Courtroom-Commissioner Borner reported that Clerk of District Court Barb Halverson has reached out to a few people regarding the storage room being built in the back of the court room. Roger from Montana Made is interested in putting a bid in and he called and spoke to the Commissioners about the job this morning. Lori Jett also said that Cliff Fawcett might be interested in the job too. Steps at the Courthouse-Commissioner Borner spoke with Fred Winkler regarding the repair of the steps. There is a possibility that the steps need to be completely removed and built again which will be an expensive job. Commissioner Borner said that the steps are a huge safety hazard and that she will keep contacting Winkler until they can give her an answer. Damaged wiring on Courthouse-Commissioner Borner sent the information to the insurance company. Computer device quotes for Commissioners-Commissioner Carlson has been talking to the IT expert Adam Toombs regarding the purchase of computers for all three Commissioners. The cost of the three devices was a little different compared to what was expected but the cost is still under $5,000. Commissioner Borner checked the budget and there is enough money in the computer budget to purchase the Commissioners computers. The two Commissioners will discuss with Commissioner Berry today when he calls in for the 3:00 business. Maintenance Supervisor Jett gave her weekly report to the Commissioners. Supervisor Jett reported that she will make a master list of contractors so that the County will have easy access to it when needed. Ms. Jett also discussed the storage room downstairs in the county complex and how County Agent Mat Walter needs to go through it and throw a lot of the stuff away. Commissioner Borner said that they will talk about storage issues at the Department Head meeting today a noon. Ms. Jett also discussed the replacement of the steam traps and if she should try and get another bid since she has already received two bids. The Commissioners told Ms. Jett to get as many bids as possible. Kathy Pfister asked the Commissioners if the windows on the east side of the courthouse are going to be fixed because out of the five windows, only one locks. Commissioners were not aware that the locks did not work and they will look into getting the locks fixed because at this time there are no plains on replacing the windows on the east side of the courthouse. Road Department Supervisor Tom Stockert and Road Secretary Kenner gave their weekly report. Ms. Kenner reported that they would like to use the BARSSA fund distribution this year for replacement of five new culverts. Commissioner Borner and Carlson are both okay with the road department using the BARSSA funds for culverts. Ms. Kenner discussed the possibility of financing another new motor grader with a loan like the one they are currently carrying and trading off an older grader. Commissioner Borner said that it is a good ideal and when the fiscal year is over they can discuss this issue again. NW Fuel systems showed up at the Road Department to begin installation of the new pumps, but the salesman underestimated what the cost would be to upgrade the plumbing in order to get it up to code. Ms. Kenner told salesman that they already agreed on a price and prepaid from bid agreed upon. A new price was agreed upon and work is now beginning the week of the 21st. Ms. Kenner handed in Mike C. Goffena’s Independent Contractors license. Discussed #4 partial relocation and the language for wording in “letter of intent to dedicate” for Pedrazzi’s. Discussion followed regarding paying an attorney and getting the title cleared up so that the county can move #4 Road. Commissioner Borner suggested that they will approach the County Attorney one more time to discuss if he will clear up the title or if we need to hire Gunderson. Supervisor Stockert will work with Pedrazzi and Jensen to get a temporary easement for emergency route being built. Commissioner Borner signed the Road Department credit card application for 1st Security Bank so that they can close their Wells Fargo ones. Secretary Kenner mentioned that they gave Gary Eliasson permission to take some tore up cattle guards for scrap. Carl Cedar came back into meeting and told the Road Department that he needed his bus route on Snowy Mountain Road bladed. Supervisor Stockert said the roads are a little frozen right now and they will be looking at the road when they can. Sheriff Lesnik gave his weekly report to the Commissioners. The Sheriff office had a prisoner that had a heart attack in the cell but Sheriff Lesnik gave CPR until ambulance arrived and the man made it and is still alive. Sheriff office is looking into getting a defibulator installed. Sheriff Lesnik also reported that he is in the process of getting a new data gathering system called ADSI to replace the outdated SLOTH system. Sheriff Lesnik also asked what account the money was coming out for the new patrol vehicle. Sheriff Lesnik reported that he is going out of town this weekend and will not be back until Sunday. Sheriff Lesnik reported that the interview with the possible new police office went well. The Sheriff still has to a background check on him and if everything comes back fine, they will then probably hire him. Commissioner Borner as Sheriff Lesnik to give her updates on how many felonies are charged and how many go forth. Amy Angel joined meeting at 10:30 a.m.
Accounting Supervisor Angel said that the money for the new patrol vehicle is coming out of award & indemnity fund and the other amount will be from the insurance claim. Ms. Angel mentioned that the auditors are still coming the 25th of February. Ms. Angel discussed the Coal Board Grant for Ferrell Bridge that the county is currently going for. Ms. Angel also wanted the Commissioner to know that one of the windows in her office leaks and that the contractors only replaced window and not the frame. DES Coordinator Fisher gave his weekly report to the Commissioners. Mr. Fisher handed the Commissioners the property offers to sign for the following owners: Delia Turley, Marsha Balich, Blake Lundberg, Louis Vidic, Nelle Wolfe, Rueben & Olivia Vacca, Dimmick/Kralovec, Wendy Vacca and the Zawada Family Trust. Mr. Fisher also just received an appraisal for the Archer property from Appraiser Gary Barta. Mr. Fisher handed the Commissioners the EMPG grant and funding letter that needed to be signed by the Commissioners. Bother Commissioner Borner and Commissioner Carlson signed the grant. Commissioner Borner closed the regular meeting at 11:25a.m., and opened the public hearing for the Ordinance for Burning Permits at 11:25a.m. There was no public comment regarding the first hearing of the burning permit ordinance. Commissioner Borner closed the public hearing at 11:30a.m., and opened up the regular meeting at 11:30a.m. Commissioner Borner officially made DES Coordinator Fisher the Flood Plain Manager for the County. EMT Director Ron Solberg gave his weekly report to the Commissioners. Mr. Solberg has not had time to work on moving the dispatchers. Mr. Solberg is waiting on company that installed the roof onto the EOC building to get back to him regarding the correct gage of the roof. Being no other County business Commissioner Borner closed meeting for lunch. Department Head meeting was held at the EOC building at noon. Those in attendance were Commissioner Borner, Commissioner Carlson, DES Coordinator Floyd Fisher, EMT Director Ron Solberg, Justice of the Peace Brad Marking, County Attorney Kevin Peterson, Accounting Supervisor Amy Angel, County Superintendent of School Kathy Pfister, Treasurer Darcie Hetrick, Sheriff Shawn Lesnik, Weed Coordinator Meriel Beck, Road Supervisor Thomas Stockert, Clerk & Recorder Cheryl Tomassi and Clerk of District Court Barb Halverson. Meeting adjourned at 1:00 p.m.
2:00 p.m. Commissioner Borner called Attorney Mike Meloy regarding the Burns vs Election Administrator Tomassi/Musselshell County case. Present at the meeting was also Commissioner Carlson and Clerk & Recorder Tomassi. Attorney Meloy will take the case and he will submit an order to the court dismissing the case. Attorney Meloy mentioned that he will see what Lisa Spears proposes to the courts regarding the fees and then either the county pays them or negotiates them. Commissioner Borner opened the 3:00 business meeting. Commissioner Berry is in Mesa Arizona, but was present by phone. There was no Public Comment. Commissioner Carlson made motion to discuss and decide on hiring an Attorney for probable on the #4 Road relocation. Commissioner Berry seconded the motion. Commissioner discussed that Road Supervisor Thomas Stockert discussed this issue this morning to move forward with the process. The Commissioners discussed that the county can either move forward with our County Attorney doing the legal work or hire an Attorney to do the legal work if our County Attorney is not willing to help. Commissioner Berry does not oppose this ideal. Commissioner Carlson made motion to move forward to probate the County road with our County Attorney if not then to move forward with Gunderson. Commissioner Berry seconded the motion. Motion Carried. Commissioner Borner made motion to discuss and hire an attorney to represent Election Administrator Cheryl Tomassi and Musselshell County. Commissioner Berry seconded the motion. Commissioner Borner discussed how the County Attorney filed a motion in District Court to withdrawal from the case. Commissioner Borner spoke with MACo and they gave her a couple of Attorneys to call. The Commissioners spoke with Attorney Mike Meloy today and he is willing to take the case. Commissioner Borner motioned to hire Attorney Mike Meloy. Commissioner Berry seconded the motion. Motion Carried. Commissioner Borner mentioned that they reviewed the Renewal Application for 2019-2020 submitted by Montana Association of Counties and there are items that they need more information on. Commissioner Carlson motioned to table. Commissioner Berry seconded the motion. Motion was tabled. Commissioner Carlson motioned to approve the 2019-2020 PCT Renewal Scheduled Acknowledgement form submitted by MACo. Commissioner Berry seconded motion. Commissioner Borner wanted Cody Samuelson from Key Insurance to review this form with the Commissioners prior to approval. Commissioner Berry amended motion to sign but not submit the 2019-2020 PCT Renewal Schedule Acknowledgement form with Cody from Key Insurance prior to submitting. Commissioner Carlson seconded motion. Motion carried. Commissioner Borner discussed that Brian Johnson was concerned that the county was not happy with the work completed on the Central Common’s. Commissioners have not received anything back from Jeremy at WWC Engineering or Stahley. Commissioner Berry motioned to table on hiring an Engineering firm for the Central Common’s structural issues. Commissioner Carlson seconded motion. Motion was tabled. Commissioner Berry motion to approve and sign all offers as per Mr. Barta’s appraisal amounts listed on items 6-17. Commissioner Carlson seconded motion. Commissioner Borner pointed out that there was an error on number 15 of the agenda and that the appraisal amount should be $81,000 not $50,000. The total amount $682,000.00. Motion Carried. Commissioner Carlson made motion to approve and sign the Right-Of-Way Easement from Mid-Rivers Communications regarding placing telecommunications cable in Township 8 North, Range 25 East, and Section 1 COS 2003-8AL Tract A. Commissioner Berry seconded motion. Motion carried. Commissioner Carlson discussed with Adam Toombs from the IT Department regarding the prices of three computers. Commissioner Borner mentioned that there was money in the budget to cover the cost of three computers. Commissioner Carlson made motion to approve and purchase three computers for the County Commissioners that will help them do business from here or afar. Commissioner Berry seconded motion. Motion Carried. There being no further business the meeting was closed at 3:18 p.m.
Commissioner Borner wanted to make sure that Commissioner Berry was aware that she was making a formal complaint against Wally Congdon. Commissioner Berry acknowledged. Being there was nothing else to discuss, Commissioner Berry disconnected from the meeting. 3:40 Commissioner Borner and Carlson called County Attorney Kevin Peterson up to their office to discuss the #4 Road.